“However, as countries consider replacing current first-line treatment with now less expensive dolutegravir-based treatment, it is important to evaluate the risks and benefits of using it globally for millions of women who could become pregnant,” she said. 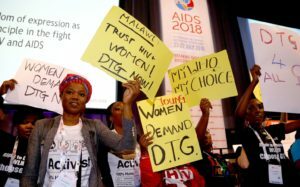 Anton Pozniak, former president of the International Aids Society who was not involved in this latest study, said the research could not be looked at in isolation. The researchers behind the Botswana study are due to publish more data within the next few months which, alongside this and other studies, will help policymakers decide on a definitive course of action. “The background rate of neural tube defects is about one in 1000 and there’s been a cluster of cases in one country in one study. We don’t know if that’s happened by chance – for example, they don’t put folic acid in food in Botswana. Could it be due to that or other issues? The world is waiting to find out,” said Dr Pozniak, an HIV specialist at Chelsea and Westminster Hospital. Linda-Gail Bekker, professor of medicine at the University of Cape Town and co-author of the study, said: “The results of this modeling study show us that the issue is not so simple as saying we should take dolutegravir off the table because a woman might become pregnant.